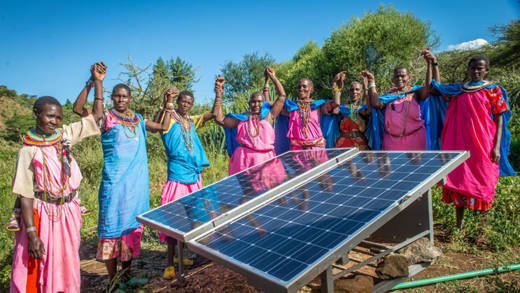 Women in Kenya celebrate installing a solar panel, supplied by CAFOD partner Caritas Isiolo, which will provide power for schools, clinics and irrigation systems and will help tackle climate change. Climate change poses a huge threat to poverty eradication. Evidence from CAFOD’s 42 partner countries shows that a changing climate is making it more difficult for poor communities to lift themselves out of poverty. Pope Francis has called climate change “a global problem with grave implications: environmental, social, economic, political and for the distribution of goods.” It is “one of the principal challenges facing humanity in our day”. As such, climate change calls for “an integrated approach to combating poverty, restoring dignity to the excluded, and at the same time protecting nature" – or “integral ecology” (Laudato Si’ or Care for our Common Home). The most urgent change needed is to shift from polluting fossil fuels to more sustainable and efficient energy systems. This shift must also benefit the billions of people who currently do not have modern energy. As the new Sustainable Development Goal 7 on energy recognises, universal access to affordable, reliable and safe energy by 2030 is crucial to end poverty and for sustainable development. CAFOD is collaborating with the Overseas Development Institute (ODI) to research the availability and impact of support for access to modern energy by poor and vulnerable groups. This research is included in the work programme of Sustainable Energy for All’s People-Centred Accelerator. See our Working Paper on Energy Safety Nets. CAFOD is collaborating with the International Institute for Environment and Development on approaches to planning energy services to meet the needs of poor communities, ensuring sustainability and maximizing development impact. Find out more about the EDM Toolkit. For more about CAFOD’s policy work on climate change, integral ecology and sustainable energy for everyone, see below.